Marked by a series of small but quality pop-up exhibitions, major retrospectives, open ateliers and brand showcases, Design September Brussels infiltrated the capital this past month, with the latests creations from all three Belgian regions, not to mention, greater Europe. A major focal point was Dialogue, Belgian Design News – bringing 30 diverse Flemish, Bruxelleoise and Walloon designers together for an eclectic presenting of small- to large-scale projects – objects, furniture, lighting, jewelry, housing accessories and even firearms. Curators and emerging talents in their own right, Quentin de Coster and Frederik Delbart mounted the exhibition at the grand Espace Wallonie de Bruxelles, right behind the iconic Grande Place. Among a slew of works by established masters such as Piet Stockmans, Nedda El-Asmar and Xavier Lust, Tracks by Alain Gilles emulates a sense of Belgian humour and surrealism. 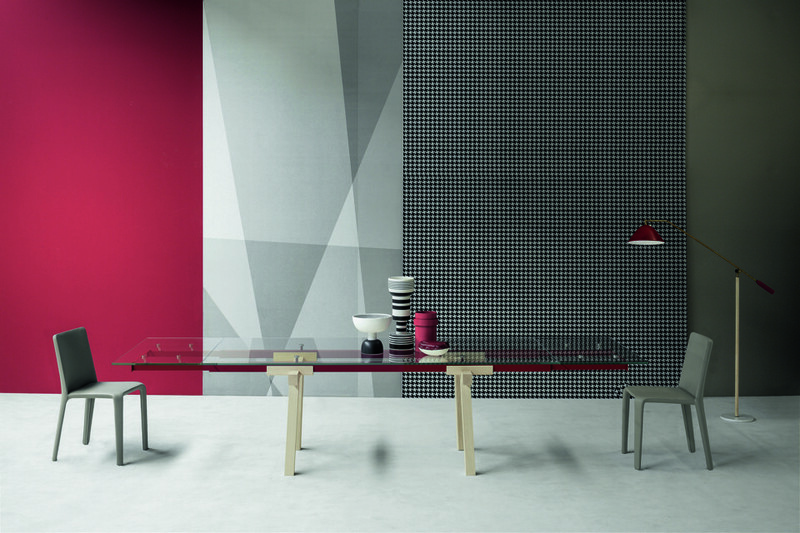 Playing on the literal movement of tables through graphic and architectural interpretation, railroad-inspired red and white stripes printed studs extend out under a glass table surface. Not surprisingly, the layers of reference Gilles taps into don’t omit the current Memphis revivals. Within the selection of up-and-coming studios, LeviSarha’s Mirror collection might have very well pulled from the same trend while vying for quality and longevity. 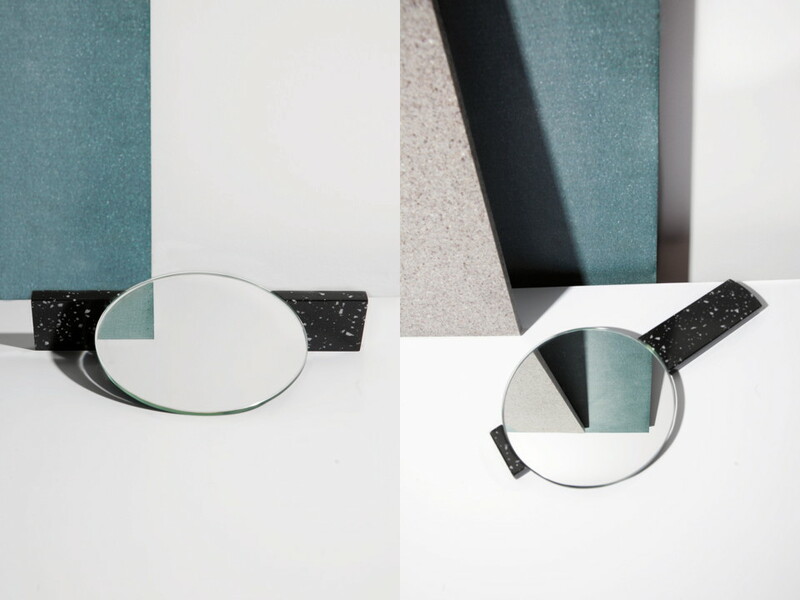 Working with Corian – highly resistant acrylic stone, normally used in high-end kitchen countertops or bathroom vanities – the design duo utilized leftovers to create a series of rounded mirrors mounted into various milled bases. 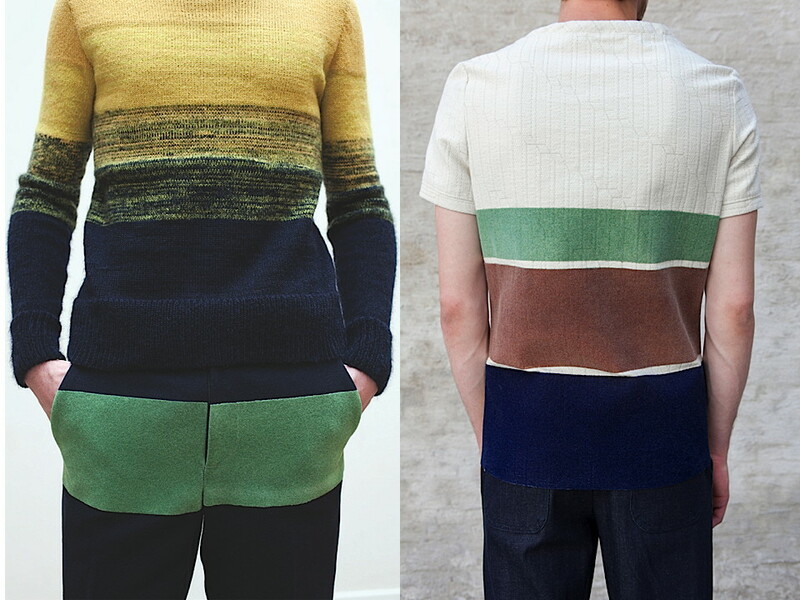 Adrian Madlener, a recent graduate of the Design Academy Eindhoven, is a designer turned journalist. Originally from Belgium, he grew up in New York where an early interest in architecture exposed him to a wide range of creative disciplines; everything from contemporary dance to fine art, and eventually design. During his studies in Eindhoven, Adrian discovered that his true calling lays within design theory, history, and criticism. Though writing is his best design tool, he still gains great satisfaction from sketching, modeling, and experimenting with material. The critic should create to critique. Recently back in the region, Adrian shares his perspective on Belgium's rapidly growing creative front. Spring-boarding new talents out of leading international fashion schools, clothing-brand H&M sponsors a yearly design award. This year, La Cambre graduate Eddy Anemian won top prize – 50 thousand euros and a catwalk show at Stockholm Fashion Week on January 28th. Among the other seven finalists - each winning five thousand euros – Royal Academy of Antwerp postgraduate Devon Halfnight Leflufy was a strong contender. 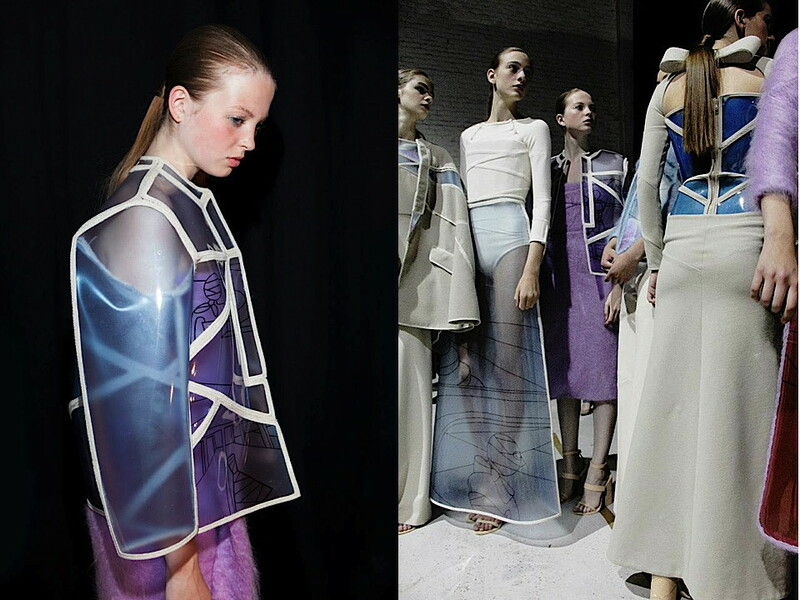 With two of Belgium’s top fashion programmes represented, Belgitude delved into both celebrate collections. French Brussels-based Eddy Anemian’s graduating collection from La Cambre was inspired by Tilda Swinton’s performance in the Italian movie – Io Sono L’Amore (I Am Love) – but also, French painter Ingres’ Grande Odalisque. Both elicit a sense of aristocratic beauty and elegance. Translating patterns found in both the movie and painting, Anemian created flowery camouflages for his dress-based collection, intended to counteract fragility and innocence. Cutting and rearranging old motifs, highly textured pieces gained an impressionistic quality. Built around the waist, each piece is balanced with minimal elements. 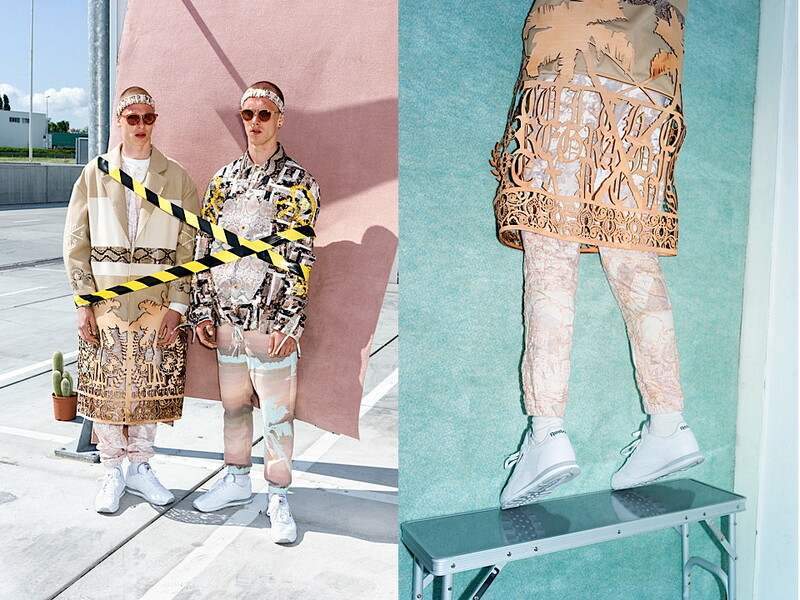 Capturing the hybrid iconography of Los Angeles sub cultures, Royal Academy of Antwerp postgraduate Devon Halfnight Leflufy was selected by Suzy Menkes and Dries van Noten as the most promising designer from the 2013 graduating class. Soon after his first defile, Leflufy’s True Believer collection was picked up by Opening Ceremony and is currently sold in their New York, Paris and Los Angeles flagship stores. Tracksuits melt seamlessly into embroidered cashmere. The luxurious street-wear features prints and masks designed in collaboration with New York-based artists Brian Kokoska. Python and hand-made quilts juxtapose natural silks, cotton and leather. Laser-cut patterns join hand-painted pastel and acid green jackets to emulate a teenage style. Leflufy also developed sunglasses with Belgian eye-wear brand Theo. How can contemporary design reinterpret and apply modernist values without adulterating their intended nature? 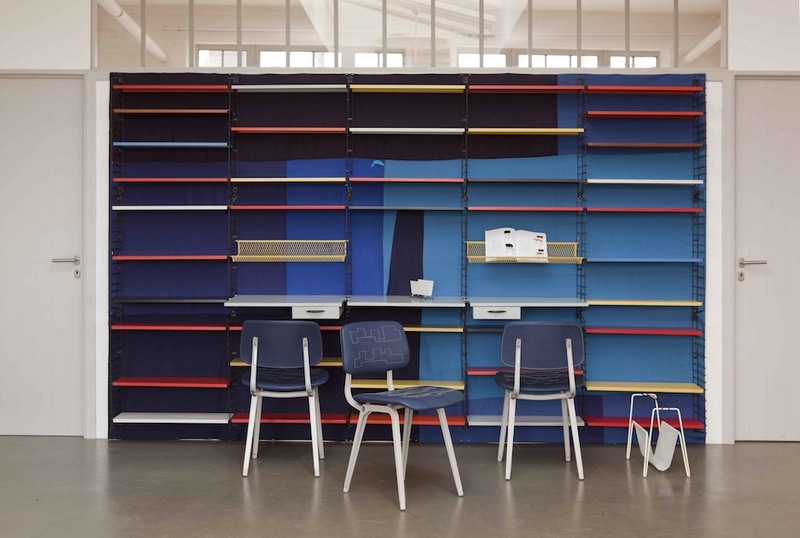 Past Present Live Different is a innovative project combing the furniture expertise of Emmanuelle Einhorn and Istvan Zelnik with Christine Hermans’ textile design know-how. The Brussels-based team debuted their revived Mid-Century Modern collection during Design September and will present a full collection during Amsterdam’s Design Icons fair – 8 to 9 February 2014. Restoring rather than recycling Pastoe and Ligne Roset classics, the collaboration brings back quality woods and finishes while updating upholstery. At the same time, Past Present Live Different explores a post World War II philosophy still relevant today and in the future, where furniture plays a role in redefining how we live. Pastoe chief-designer – from 1945 to 1978 – Cees Braakman believed in promoting a revolutionary style but also an new way of living. 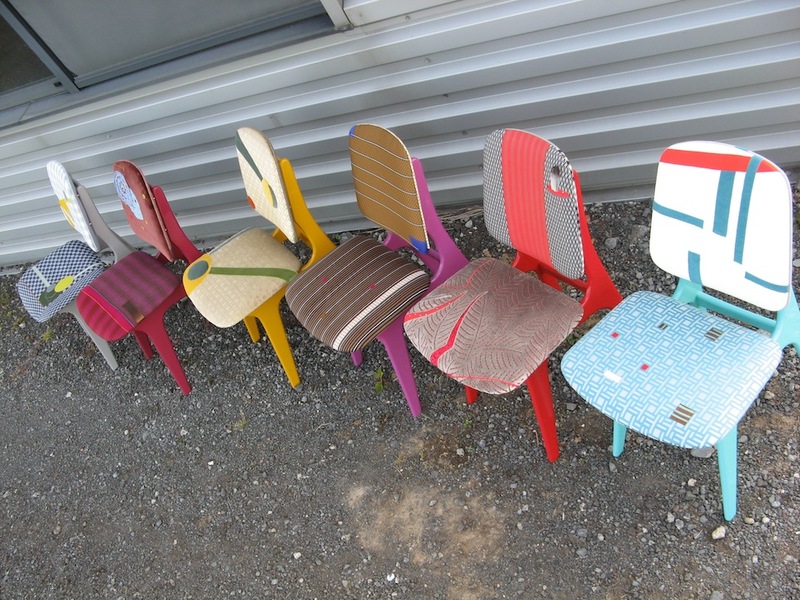 With a strong vide grenier – second hand furniture – culture rife in Brussels, Einhorn and Zelnik are able to select the very best items. With a degree in art history – specializing in contemporary art – Einhorn began her career in the antiques trade. During the early 2000’s, she cornered the European Ebay market and worked for Sablon-based M. Jacques Dubarry Lassalle. Zelnik recently joined his wife. Applying a wide scope of literary and artistic knowledge, Hermans established her textile design practice almost 20 years-ago. In 1994, she marked this new venture by presenting her Première Classe scarves in Paris, later sold at Harrods in London. Subsequent projects – including a Step by Step furniture and Au Début du Siècle children's-wear collections – Hermans eventually moved towards interior design. Within all of these project, she was able to channel an iconoclastic curiosity and deep passion for mythology. 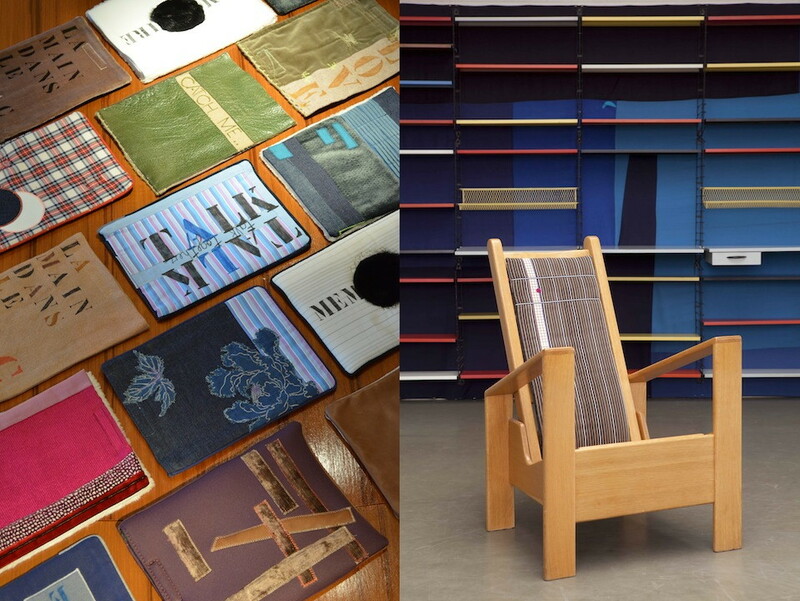 With Past Present Live Different, Hermans reupholsters sofas and chairs using eclectic textile collages. Expressing the contemporary trends of personalization and personification, each piece has a given name. The Tic-Tac rocking-chair employs embed leather buttons and black velour to create a sober and minimal silhouette. Silk-screened words of inspiration allude back to Pastoe’s late modernist ideal of changing the way we live. Hermans is interested in discovering what tomorrow will bring and at the same time emulates a certain art de vivre – family spirit. The Past Present Live Different collection has grown with entirely new concepts including Nomade, a pouf conducive with society’s increasingly transient nature. 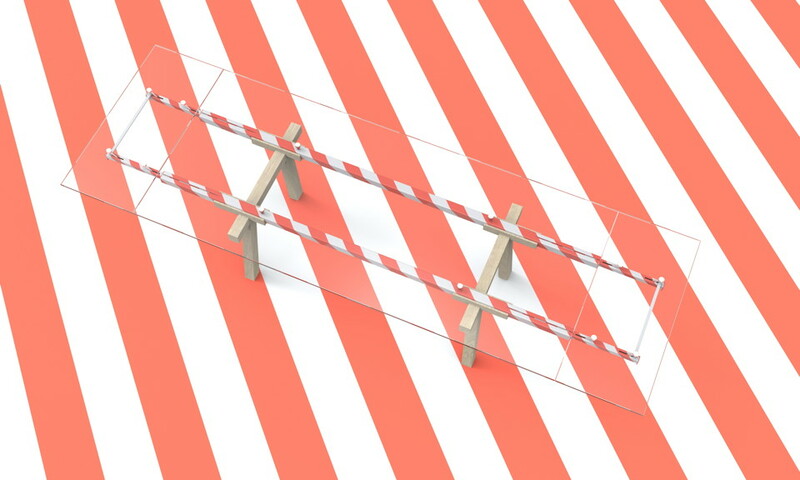 Adrian Madlener, a recent graduate of the Design Academy Eindhoven, is a designer turned journalist. Originally from Belgium, he grew up in New York where an early interest in architecture exposed him to a wide range of creative disciplines; everything from contemporary dance to fine art, and eventually design. During his studies in Eindhoven, Adrian discovered that his true calling lays within design theory, history, and criticism. Though writing is his best design tool, he still gains great satisfaction from sketching, modeling, and experimenting with material. The critic should create to critique. Recently back in his native Brussels, Adrian shares his perspective on Belgium's rapidly growing creative front. Along the edge of Antwerp's massive shipping lanes, the converted Hangar 28 played host to one of this city’s highly influential events, The 2013 Antwerp Fashion Department Défilé on June 14th/15th. Fashion rings through these quiet but highly cultivated streets, the noise of course comes from the Royal Academy of Fine Arts (Artesis) Antwerp Fashion Department or the nearby Nationaalstraat with its globally heralded fashion showrooms and MoMu fashion museum. Of course this year was special, celebrating the 50 years of this faculty’s inception, certainly in tune with Flander’s long tradition of textile production. Perhaps more recent in history, the 2013 Antwerp Fashion Show also marked the 30 year reunion of the Antwerp Six forming the jury for the 4th year masters, who respectively, made quite a loud entrance into the fashion world. 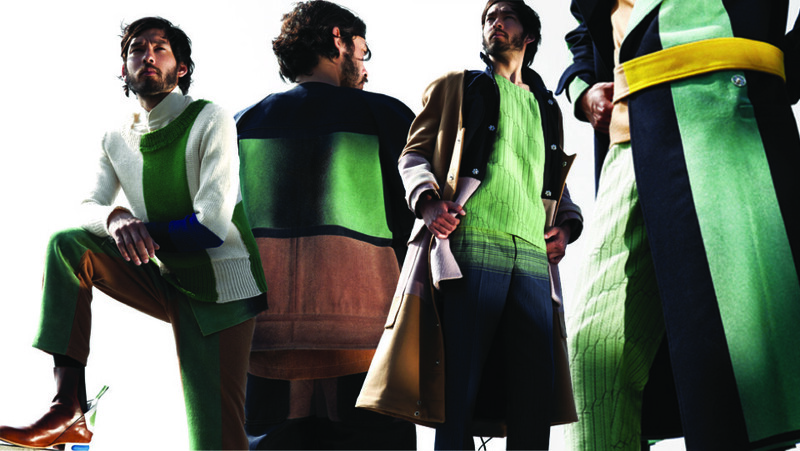 Since Van Notten, Demeulemeester, Van Saene, Yee, Van Beirendonck, and Bikkembergs broke out onto the scene almost 30 years ago, their alma mater has seen an explosion of international recognition as one of the top Fashion program, eventually resulting in a predominantly international student body. Amongst this year’s 14 graduating masters, only 3 were Flemish but arguably their work stood out. The défilé showed approximately 100 collections, moving from 1st, 2nd, and 3rd year bachelors to the greatly anticipated 4th year masters. The subsequent themes, “skirt, dress, experiment,” “historical costumes,” and “ethical costumes,” reflected the style of rigorous education this school implements as studentd progress through the years of study. Which later echoed through the master’s collections, with a clear sense of having fully grasped each of these essential steps. Burning up the fire bolt shaped runway where the “Play Time,” and “LENA” collections by both Flemish fashion designers Mattia Van Severen and Wim Bruynooghe respectively. Van Severen’s “Play Time,” took reference from Jacques Tati’s film of the same name. Juxtaposing this modernist oeuvre, a highly current exploration of minimalist shapes perfectly integrated complex textures and patterns. With an artistic trompe l’oeuill effect of negative and positive space, large geometric flocked planes of color defied the garments seams, in turn creating huge disproportional color gradient surfaces. Modestly abstracted, an eclectic mix of fluid earth tone greens and browns were subdued by deep blues but equally sparked by accents of yellow. Bruynooghe’s “LENA” studied the bond between artist and muse, perhaps even the fame fatale. Set upon the dramatic landscape of the Belgian seaside village of De Haan, the austere modernist icon of an elegant lady frozen in posture referred to the artist’s characterized illusion of his muse, not her true identity. This tension was translated into a series of multilayered garments where the under layers of draped fabric alluded to a true femininity and the top layer of clear rubber with illustrated scenes referred to a prescribed characterization. 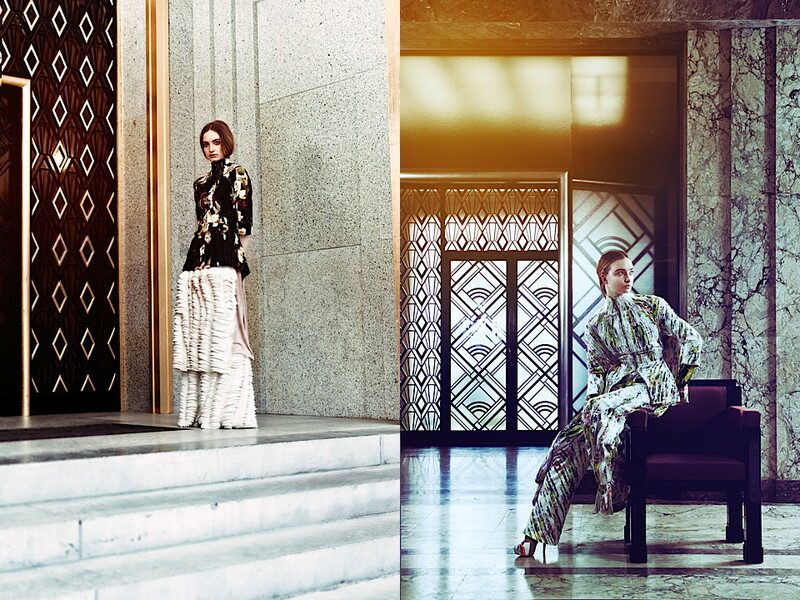 These beautifully integrated pieces reveal something of a translated modernism for our times.